Black and white negative showing Arthur Wellesley Lynde's delphinium garden. 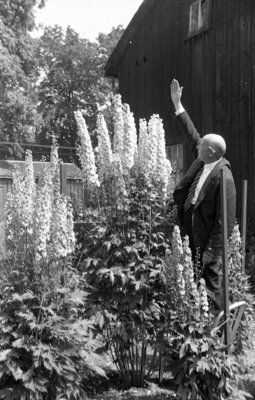 In this view Arthur is standing to the right of the delphiniums. Arthur Wellesley Lynde's Delphiniums, July 8, 1937, Marjorie Ruddy. Whitby Archives A2013_040_034C.